What’s inside Superman? Batman. What’s inside Batman? Wonder Woman. 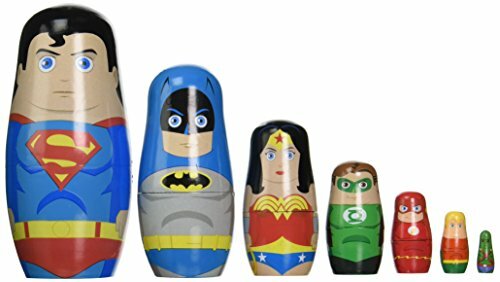 With these Justice League nesting dolls, your favorite comic book heroes all nestle neatly right inside each other and make for the perfect superhero lover’s decor. The JUSTICE LEAGUE bands together as a collectible set of exceptional wooden Russian nesting dolls. Set includes SUPERMANTM, BATMANTM, WONDER WOMANTM, GREEN LANTERNTM, THE FLASHTM, AQUAMANTM, and MARTIAN MANHUNTERTM. High-quality wooden figures with detailed artwork exemplifies each Super Hero's persona from every angle.